Bread pudding is a great use stale bread or when you buy a brand of bread that no one in the family likes. It is also a good way to use up extra milk if you find yourself with an extra carton that is starting to get old. 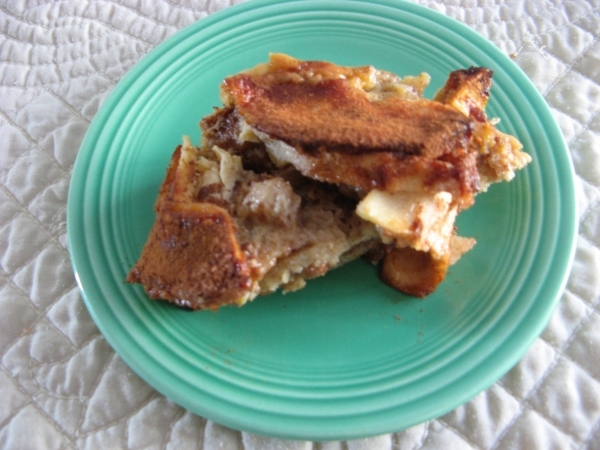 This recipe includes sliced apples with the layers of bread so with the sugar and cinnamon it is a cross between apple pie and bread pudding. All of the proportions in the recipe are approximate. I tend to sprinkle extra sugar and use a heavy hand with the cinnamon. I always fill the baking dish too full which results in a sticky mess cooking over in the oven activating the smoke alarm. 2. Place a layer of bread pieces in the bottom of a well-greased two-quart casserole or baking dish. Top with a layer of apple slices. 3. Combine 1/4 cup sugar with 1/2 teaspoon of the cinnamon and sprinkle half over the apples (depending on how sweet you like it, you can add more). Make alternate layers of bread pieces and apple slices, sprinkled with sugar-cinnamon mixture until dish is filled to within about one and on-half inches of the top. 4. Beat the eggs with on-half cup of the remaining sugar. Beat in the milk and pour over the bread and apples. Combine remaining sugar and cinnamon and sprinkle over the top. 5. Bake one and one-half hours. Serve warm with whipped cream.